Famers’ Mart was inaugurated at Navalgund taluk of Dharwad District and Hulgur of Shiggaon taluk, Haveri District in Karnataka. 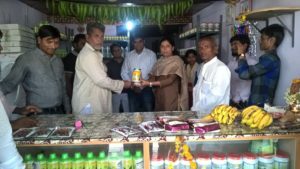 The first Farmers’ Mart Kalmeshwara Farmer Producer Company Ltd (KFPC) was inaugurated by Sheela M Bhandarkar, Dharwad District Development Officer, National Bank for Agriculture and Rural Development (NABARD) on April 2nd. 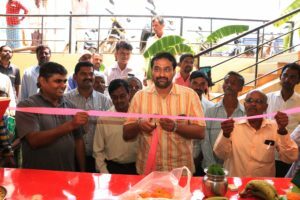 Mahadev, District Deputy Manager, NABARD inaugurating the Farmers’ Mart at Hulgur. Speaking on the occasion she said “These kinds of ventures are the need of the hour for farmers and advised farmers to come up with feasible business plans like opening a processing unit in the region, which is useful for farmers to avail good price for their productions. For such setups fund will be sanctioned under NABKISAN.” This FPC provides seeds and inputs license, drip and sprinkler dealerships support from the lead bank and 1000+ farmer bases Naveen Jha, CEO, Deshpande Foundation shared his plans to establish a Farmer’s Mall, where farmer’s productions are given a brand name, adding value to the products. This fetches more profit to the FPCs and drives towards financial sustainability. Over 6000+ farmers from 43 villages can avail this service. FPC policies are flexible. Farmer Manjunath, who was present at the program opined “The days are gone where farmers were harassed by the manipulation of middlemen. It’s like a dream come true. In the coming days, we will make this institution a successful one with good coordination and cooperation.” Similarly, a Farmer Mart of Basaveshwara Farmer Producer Company Ltd (BFPC) was inaugurated on April 5th. Sheela M Bhandarkar, Dharwad DDO, NBADR is presenting an Agri product to a farmer. Mr. Naveen Jha, CEO, Deshpande Foundation and others are also seen in the picture. On the pipeline: The third FPC – Sinchana Farmers Producer Company Ltd will be opened at Naragund of Gadag District. The farmers of 23 surrounding villages of Naragund can avail the benefits. The core strength of these FPCs is its structure, a strong foundation with their Farmer Interest Groups (FIGs) spread across villages. While the women empowerment committee of FPC ensures the welfare of women and children of farmers family. This FARMER MART is the first step of FPC towards independent agribusiness model along with innovative farm practices services, scheme convergences, etc. Minimum of 50 villages, 6000+ farmers are included in the FPC. Efforts are on by the Deshpande Foundation to increase the number of Farmers’ Mart to cover more villages in future.